During this period, the volume of new commemorative Lithuania stamps (38), for the first time, outnumbered the volume of new definitive postage stamps (26). The highlight of this period was a new series of diamond-shaped commemorative stamps, celebrating the Lithuanian annexation of Memel (Klaipėda). 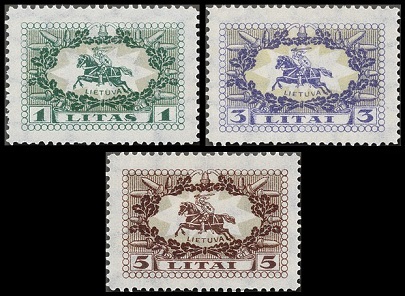 The thirteen major-type definitive Lithuania stamps shown above were issued between 1923 and 1925. Church of the Holy Trinity, called the Seminary Church, in Kaunas. 10 C. (1923 - Sc. #165) - Violet. 15 C. (1923 - Sc. #166) - Scarlet. 20 C. (1923 - Sc. #167) - Olive Brown. 25 C. (1923 - Sc. #168) - Deep Blue. 50 C. (1923 - Sc. #169) - Yellow Green. 60 C. (1923 - Sc. #170) - Red. 01 L. (1923 - Sc. #171) - Orange & Green. 03 L. (1923 - Sc. #172) - Red & Gray. 05 L. (1923 - Sc. #173) - Brown & Blue. 05 C. (1923 - Sc. #189) - Pale Green. 10 C. (1923 - Sc. #190) - Violet. 15 C. (1923 - Sc. #191) - Scarlet. 25 C. (1923 - Sc. #192) - Blue. The Scott catalog attributes, for stamps that are watermarked with a parquet design and that are perforated 11, are as follows. 02 C. (1923 - Sc. #196) - Pale Brown. 03 C. (1923 - Sc. #197) - Olive Bister. 05 C. (1923 - Sc. #198) - Pale Green. 10 C. (1923 - Sc. #199) - Violet. 25 C. (1923 - Sc. #202) - Deep Blue. 36 C. (1923 - Sc. #204) - Orange Brown. The Scott catalog attributes, for stamps that are watermarked intersecting diamonds and that are perforated 11 1/2, 14 1/2, or 11 1/2 x 14 1/2, are as follows. 25 C. (1923 - Sc. #207) - Deep Blue. 50 C. (1925 - Sc. #208) - Deep Green. 60 C. (1925 - Sc. #209) - Carmine. The thirteen diamond-shaped commemorative Lithuania stamps shown above (Sc. 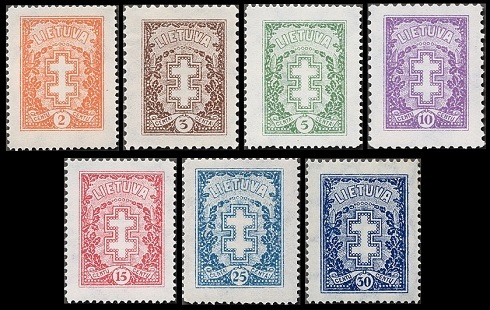 #176-188) were issued in August 1923 to celebrate the Union of Memel (Klaipėda) and Lithuania. The seven common designs are as follows. 01 C., 05 C. - Coat of Arms of Memel. 02 C., 30 C. - Coat of Arms of Lithuania. 03 C., 02 L. - Chapel of St. George on Birutė Hill in Palanga. Birutė (died 1382) was the wife of Grand Duke Kestutis (1297-1382) and the mother of Grand Duke Vytautas the Great (1350-1430). Her burial site is believed to be somewhere on Birutė Hill. 10 C., 15 C. - War Memorial in Kaunas. Completed in 1921, this memorial was dedicated to those that died during the Lithuanian War of Independence. 25 C., 03 L. - Ruins of Trakai Island Castle, built by Grand Duke Kestutis (1297-1382) during the 14th Century. 60 C., 05 L. - Memel Lighthouse. 01 L. - Memel Harbor. 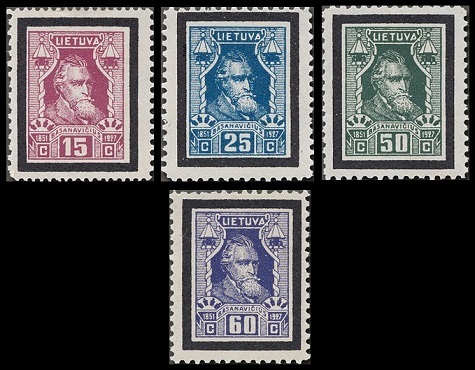 The ten major-type definitive Lithuania stamps shown above were issued between 1927 and 1931. The common designs are as follows. Vytis or the White Knight from the Coat of Arms of Lithuania. The Scott catalog attributes, for stamps that are watermarked intersecting diamonds and that are perforated 11 1/2 or 14 1/2, are as follows. 02 C. (1927 - Sc. #210) - Orange. 03 C. (1927 - Sc. #211) - Deep Brown. 05 C. (1927 - Sc. #212) - Green. 10 C. (1927 - Sc. #213) - Violet. 15 C. (1927 - Sc. #214) - Red. 25 C. (1927 - Sc. #215) - Blue. The Scott catalog attributes, for stamps that are watermarked with a parquet pattern and that are perforated 14 1/2, are as follows. 05 C. (1927 - Sc. #216) - Green. 30 C. (1930 - Sc. #217) - Blue. The Scott catalog attributes, for stamps that are watermarked webbing and that are perforated 14 1/2, are as follows. 02 C. (1931 - Sc. #233) - Orange. 05 C. (1929 - Sc. #234) - Green. 10 C. (1931 - Sc. #235) - Violet. 15 C. (1929 - Sc. #237) - Red. 30 C. (1929 - Sc. #239) - Dark Blue. 01 L. (1927 - Sc. #223) - Blue Green & Gray. 03 L. (1927 - Sc. #224) - Violet & Pale Green. 05 L. (1927 - Sc. #225) - Brown & Gray. The Scott catalog attributes, for stamps that are unwatermarked and that are perforated 14 1/2, are as follows. 15 C. (1930 - Sc. #240) - Red. The four commemorative Lithuania stamps shown above (Sc. #219-222) were issued on March 8, 1927 in honor of Dr. Jonas Basanavicius. The common design features a portrait of Dr. Jonas Basanavicius. Jonas Basanavicius (1851-1927) was a physician, writer, and political activist. He was the founder of the first Lithuanian language newspaper, the founder and chairman of the Lithuanian Scientific Society, a member of the National Council of Lithuania, and he was a signatory to the Lithuanian Declaration of Independence on February 16, 1918. Dr. Basanavicius studied Lithuanian history, culture, folklore, and linguistics, and he published more than forty works in these fields. He was given the honorary title of "Patriarch of the Nation" for his contributions. He died, in Vilnius, on February 16, 1927, Lithuanian Independence Day. 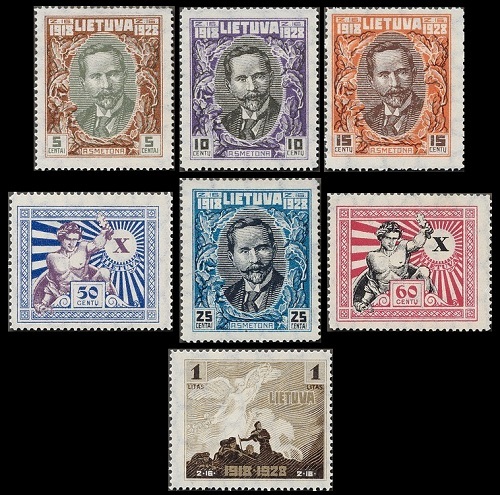 The seven commemorative Lithuania stamps shown above (Sc. #226-232) were issued on February 16, 1928 to celebrate the 10th Anniversary of Lithuanian Independence. Antanas Smetona (1874-1944), the first President of Lithuania. Allegorical representation of a Decade of Independence. Allegorical representation of the Dawn of Peace. 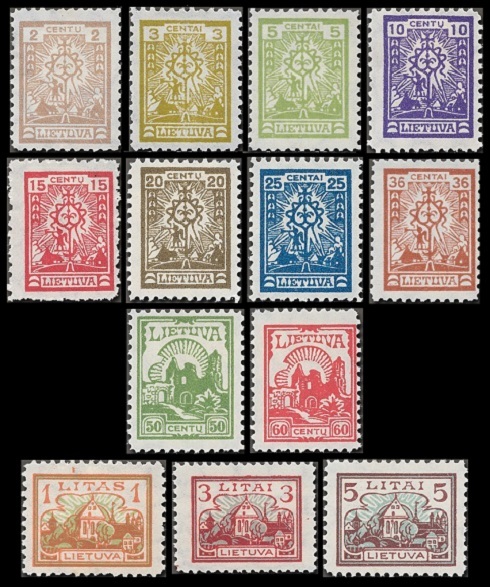 The fourteen pictorial Lithuania stamps shown above (Sc. #242-255) were issued on February 16, 1930 to commemorate the 500th Anniversary of the Death of Grand Duke Vytautas the Great. The two common designs are as follows. Portrait of Grand Duke Vytautas the Great (1350-1430). The Vytis or White Knight, the heraldic symbol of the Grand Dukes of Lithuania.